Shareholders of Yum Brands, the owner of Taco Bell, KFC and Pizza Hut, are smiling today after shares shot up over 8% yesterday. Yum’s profits jumped 23% thanks to their US restaurants. In an ironic twist, China’s growth is slower and the US market – saturated with restaurants – is where Yum found a path to profits. 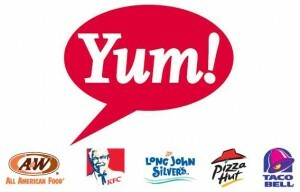 Yum is expecting 13% earnings-per-share – better than last year’s 12%. Taco Bell saved the day for Yum. The restaurant chain had been struggling in 2011. This year, Taco Bell cut a deal with Doritos to create Doritos Locos Tacos. Both companies are Pepsi spin-offs. It’s not hard to imagine executives of both companies sitting for lunch and trying to come up with ways to work together again. The Doritos flavored taco shells are a hit in the US. Taco Bell’s same store sales rose 7% in the last quarter. Pizza Hut rose 6% and KFC saw a 4% boost. Yum has 18,000 restaurants in the US and almost 5,000 in China. While KFC is a hit in China, in the US, Taco Bell and Doritos are the restaurant success story of the season.